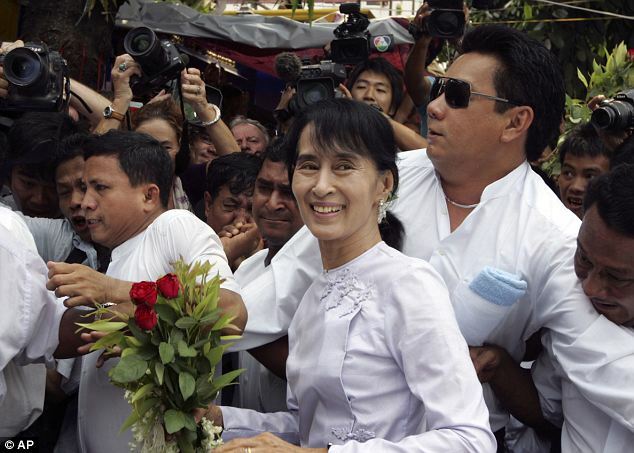 Back in early December, we looked at some positive movements in Burma - namely when Nobel Peace Prize laureate Aung San Suu Kyi was given freedom from nearly two decades of house arrest. Since that time she boldly embarked on a round of speeches in the country promoting her vision of a democratic Burma (Republic of Myanmar), and declaring that she would stand for parliamentary office in by-elections to be held in the spring of 2012 to fill 45 vacant seats. Those elections have been held - last Sunday - and somewhat stunningly, Suu Kyi's party, the National League for Democracy, after contesting 44 of the 45 vacant seats, won 43 out of those 44. Aung San Suu Kyi, indeed, was elected herself and is now headed for the Burmese parliament - reminiscent of the Czech Republic's own Vaclav Havel, who ascended to the Presidency nearly direct from the status of political prisoner. 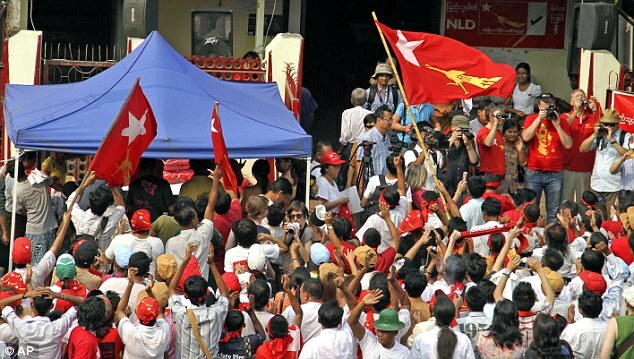 Supporters at the NLD headquarters jubilant upon hearing the election results. As the UK Daily Mail noted at the time, "There was no word from the ruling Union Solidarity and Development Party (USDP), which was formed by the military junta before it ceded power a year ago, or the Election Commission on the outcome of Sunday's ballots. If confirmed, the sweep would mean the NLD even won four seats in the capital, Naypyitaw, a new city built by the former junta where most of the residents are government employees and military personnel, who were expected to back the USDP, the parliament's dominant party." The ruling USDP party is of course, still dominant in Parliament. The governing structure itself - Pyidaungsu Hluttaw - similar to the US Congress is made up of two houses, the Amyotha Hluttaw (House of Nationalities), a 224-seat upper house as well as the Pyithu Hluttaw, a 440-seat lower house (House of Representatives). So the 43 seats taken by the NLD is not a sea change. But, the reasonably fair elections, and the quiet acceptance of the results by the governing party (headed by Burma's President Thein Sein) is very positive. His party, the USDP is said to be reviewing its own positions in light of larger parliamentary elections due in 2015. Whatever the positions taken, let's hope that all parties can see that regardless of their own political perspective, it is in everyone's interest to continue on the path for a responsive government and status among the nations as a responsible, thoughtful country in its foreign relations. During the past few days, the "fruits" of holding an open and generally acknowledged fair election began to emerge with the news that the US (as well as Australia and the European Union) would be reviewing economic sanctions against the country that have been in place for some time. US Senator John McCain, who had met with Aung San Suu Kyi in January 2012, said “We should now work with our many international partners to begin the process of easing sanctions on Burma. This will be a gradual and incremental process, and the U.S. Congress will have a critical role to play.” The Obama administration announced that it would nominate an ambassador to the country and ease some travel and finance restrictions, without specifying a time table. Secretary of State Hillary Clinton said “The results of the parliamentary by-elections represents a dramatic demonstration of popular will that brings a new generation of reformers into government. This is an important step in the country’s transformation, which in recent months has seen the unprecedented release of political prisoners, new legislation broadening the rights of political and civic association, and fledgling process in internal dialogue between the government and ethnic minority groups." Leaders of the Southeast Asian trading block and alliance - the ASEAN - including those from Cambodia, Malaysia, and Indonesia, have called for the immediate removal of sanctions. Singapore's Prime Minister said the following: "President Thein Sein has been much bolder than many observers have expected. ASEAN is happy that Myanmar has been able to take these steps forward." ASEAN leaders at a recent summit where Burma direction towards democracy was a hot topic. ASEAN member countries are: Brunei, Cambodia, Laos, Indonesia, Myanmar, Philippines, Malaysia, Singapore, Thailand, and Vietnam. So a positive story nestled between the continuing malaise of violence and resort to arms found in Mali, Syria, Sudan's split entities, and Libya.